Home » Articles » 35. Let Go, Straighten Up and Throw Away! 35. Let Go, Straighten Up and Throw Away! Recipe for holding onto a busy life: keeping balls in the air. Throw them high enough so you have enough time to keep the other balls in the air. Keep arms, back and shoulders in the same position. Make quick movements, use ultimate concentration and keep those balls from falling. 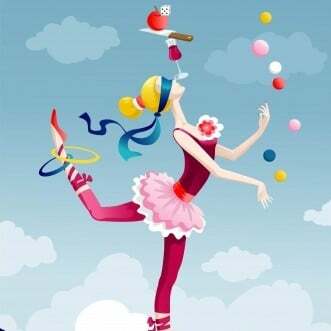 Be flexible for balls that get slightly off course and, oh yeah, most especially, use a lot of balls at the same time. In addition, keep a tight rein on everything. As though you were trying to lead 10 horses at the same time. And preferably while wearing a backpack with baggage from your entire past and the 50 lives before that. That’s what ‘holding onto’ things looks like. We waste a lot of energy with our attempts to keep everything as it should be and keeping things under control. Our bodies are empty from it and our brains full. If you use the MIR-Method, you let go. Fewer plates to keep in the air. You stop the extra projects, leave the board or don’t babysit the (grand)children as often. Besides this, the backpack empties. Old junk is deleted. Painful memories soften and don’t take up as much room inside. Lastly, you let go of the reins. Some reins were already a part of one-way traffic and you were the only one really working them. You can gently and lovingly loosen some reins so the contact slowly becomes more balanced. Lovingly loosening the reins leads to saying goodbye. From tasks, from people, from possessions. People’s drain is plugged, causing the water to rise until it overwhelms them. Pull the plug, let the dirty water drain away. That feels good! Say goodbye to stuff: throw things away. Walk through your house and look for things that make you feel uncomfortable. You have a choice: either you erase the unpleasant feeling (MIR-Method), or you throw it away! The painting from your aunt who you didn’t visit often enough when she was still alive. The toys your grown children liked to play with so much. The books you were planning to read some day. The thrift shop is happy with these things! Spaces where rubbish accumulates, another thing. The spot in your house where you’ve just got too much. The attic, the storeroom, the shed or underneath the eaves of your appartment. If you do the MIR-Method, you’ll get an eye for it and want to get rid of it. And what if these filled-up spaces are a symbol of your own upper room (mind)? That also starts to feel roomier and emptier! A neat house is a neat mind! How does the MIR-Method make you let go? Manifestation-power is one of the new energies you’ll feel when you do the MIR-Method. Your backbone becomes strong and you start to take steps. Step 4 “Clear meridians” and step 8 “Optimize Chakras and Aura” play the leading role in this. Step 1 “Optimize acidity”. When your body has the correct acidity, it can get rid of waste products. Step 2 “Detox all toxicity”. Not only waste products will be disposed of, but toxic relationships, toxic thoughts and old emotions as well that are still functioning as sand in your motor. Step 3 “Detach father. Detach mother”. You let go of everyone who is still preventing you from taking steps. You don’t use your energy any more in contacts that are not reciprocal. Mothers let go of their adult children. Step 4 “Clear meridians”. The bladder meridian is involved in making decisions and insecurity. Once your bladder meridian is flowing again, you can make stronger decisions and strengthen your backbone; you stand behind your decisions. Your self-confidence grows because you let go of your insecurity. Step 5 “Supplement all shortages”. By supplementing nutritional shortages, you’ll renew your energy. You need that to straighten things up and get rid of things! Step 6 “Balance hormone system”. The hormone system has a direct link to “motherhood” and “taking care of”. By restoring the balance of your hormone system, you’ll find more balance between “taking care of others” and “taking care of yourself”. Step 7 “Fulfill basic needs”. “Room” is one of our basic needs. Our own space. An overview. Your things in the correct place. When you do step 7, you strengthen your need for Room. We’re talking about actual space to move around in: you become more aware, for example, that there are boxes in your pantry and work through them, so you literally have more space to move around in. Step 8 “Optimize Chakras and Aura”. Your aura becomes stronger, allowing fewer people into your energy. Your chakras become stronger; especially chakra 3, which stands for your will and literally taking steps. It becomes easier to make something, to be creative. Step 9 “Clarify mission”. You let go of what doesn’t fit your mission any more. People, work, convictions. You attract what belongs to your mission: new people, different work, new thoughts and convictions. I wish you much pleasure letting go, straightening up and throwing away! Have you also had the experience with the MIR-Method that you suddenly started straightening up and throwing things away? That there is a change in the group of people surrounding you? Write about it below! Thank you! P.S. Please send this article to other people! You can use the icons for Facebook, Twitter and Linked-in below and to the left. Thank you! I started doing the MIR method a couple of weeks ago and without any expectations. I found my facial skin becoming clearer and brighter.The second thing I noticed was decluttering,though that is happening v–e–r–y slowly.But it is happening! I will continue to do it and maybe some other things will get cleared out of my life! I am happy for you! Especially the skin of your face is so important to be clear and bright! Yes, let the decluttering just continu, slowly but surely. When you toss out something every day, in the end your house will be organised again! Keep going! And thank you for letting me know! I started MIR-Method 4days ago because I have bakers cyst ..my back of knee on the right hurts and unable to bend …so I did what you said in the video….it starting to feel better and less painful to move it definitely a great improvement….thank you….I also noticed frequent bowel movement but my urine is clear…….what does it mean……I will cont the method until my knee completly heals…….thank you so much …I love you and more power to you……. Thank you for your loving words! I am very happy for you that your knee is better! The bowel movement can be temporarily thinner and more. Don’t worry, that is absolutely normal and a signal that your intestines are cleaning themselves! I think here is a mistake because this is the 35th article not the 37th. Anyway I love your articles and I cant wait the new one. 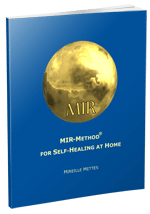 I wish you a lot of success with the MIR-Method! Thank you for telling me! I changed the number quickly. Am glad you like the articles! I love writing them and hope to inspire many, many people. Hope the MIR-Method brings you a lot of good!